The KeyNote Session on Saturday was a double-whammy, with A J Jacobs, creator of The Global Family Reunion, followed by Donny Osmond. You can watch the entire session here. 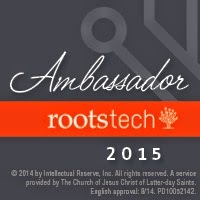 The session started with the announcement of the Grand Prize Winner of the RootsTech 2015 Innovator Showdown, which was Storyworth, a service which is designed to help people record their family stories. A J Jacobs described how he came to be organising the world's largest family get-together, the Global Family Reunion on 6th June 2015. We all had "I am a Cousin" signs under our chairs so that when A J Jacobs came on stage, we would hold them up to welcome him. He also described us how he "lived the bible" for a whole year. I found his presentation very amusing, and am disappointed that a prior engagement on 6th June 2015 will preclude me joining in the Global Family Reunion festivities. Donny Osmond, who needs no introduction, regaled us with his family stories - as well as a bit of singing. He can still sing! He was also very amusing. Myko confirmed quite a few new partnerships that FindMyPast is looking into. In particular the partnership with FamilyTreeDNA could be very interesting to the UK genealogy community, who have not yet fully embraced the possibilities afforded by the use of DNA tests in genealogy research. Later that day, I attended the Ancestry sponsored lunch, where they, too, were talking about DNA. Honestly, everyone seemed to be talking about DNA, it seems to have finally "come of age". I learnt all about Ancestry's DNA circles, and how they have recently improved their algorithms, which should produce fewer "false positives". As AncestryDNA has only just launched in the UK, I don't think many UK genealogists yet know about Ancestry's DNA circles. As the AncestryDNA test is an autosomal test, which looks at your entire ancestry within recent generations, what Ancestry try and do with the results, is to match up people who "might" share the same ancestors, in a similar way to the way the shaky leaf hints suggest people who "might" share your tree when looking at historical records. Some of the question and answer session was a little bit beyond me, to be honest, although now my AncestryDNA results are in, I'm hoping to be joined into a DNA circle very soon! The other main announcement coming from AncestryDNA, is that they hope to be launching in Australia and Canada soon. This will also help to widen the database of people who have tested with AncestryDNA, which currently stands at 700,000. Thank you to Myko, Paul and Tessa for taking time out of their busy schedules for my interviews. Thank you Jana, and I'm glad that you've found my blog!